Tarek Atrissi Design developed for Georgetown University in Qatar a logo design and the basic guidelines for their corporate identity. The logo design for the school of foreign services in Qatar presented the challenges of having a very long bilingual name, which required to maintain the identity of the international mother brand while creating a subtle local flavor unique to the school campus in Doha. The final wordmark created with classic Arabic Calligraphy the Arabic name of “Georgetown University”, while the rest of the wordmark was created in a well selected mix of Latin and Arabic typefaces. 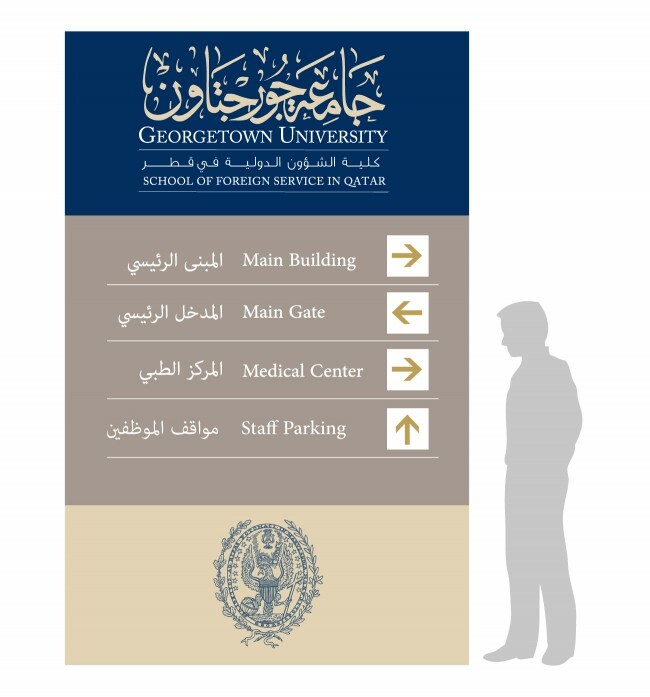 A specific color palette was defined for the Qatar campus, and the rest of the design applications such as the signage design used occasionally the seal of Georgetown University.